As vault doors in many applications are commonly left open during operating hours, day gates provide quick keyed access to the vault without the user having to throw the combination lock on the vault door every time they need to access during open hours. International Vault provides a full line of day gates for use with any manufacturer's vault systems as well as our own GSA and UL certified vault doors and modular vaults. Electric strike configurations provide for door operation without the use of mechanical lock or key. The purpose of day gates is to deter criminals from attempting smash and grab attacks during hours in which the main vault door is open. Day gates feature a standard lever handle exterior key in and interior thumb turn out. Also available are ADA handles with dual levers, interior and exterior. Contact us today to learn more about the available day gate options for the Gladiator and Excalibur Vault Doors by International Vault. Our UL Vault Door day gates come in standard sizes to match our 36" and 52" clear opening vault doors, including our Excalibur and Gladiator doors. Acrylic - acrylic day gates can be outfitted with either clear or smoked acrylic sheeting and come standard with an aluminum frame. Bar Style - Bar Style day gates are constructed with aluminum bars oriented horizontally with an aluminum frame. Bars are spaced tighter near the locking mechanism to prevent unauthorized access. All aluminum on the day gates will have a brushed style finish. The day gates for The Scimitar Class 5-A and 5-V Vault Doors come in a variety of styles and configurations. When used with a Class 5-A Armory style Scimitar Vault Door, we can provide a Weapons Issue Port for passage of weapons and ammunition to users by an armorer. Day gates with a weapons port can be Dutch Style with a top half that can open while the bottom half remains secured, or the day gate can be entirely fixed with side or opening weapons issue port in the center. Shelving ready to be directly affixed to the day gate is also available. 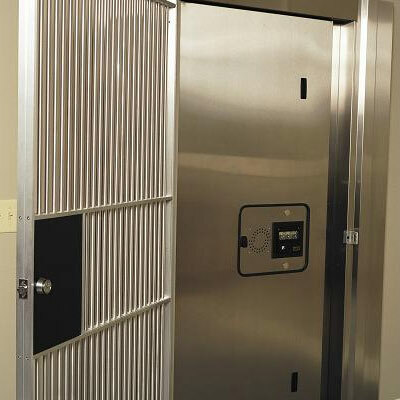 For the Class 5-V Scimitar Vault Door, we offer a standard Expanded Metal Day Gate. This day gate has no openings or issue ports and is meant for classified material access during operational hours when the vault door is open. Contact International Vault today to learn more about day gate options for our Scimitar Vault Doors. As an option to traditional fixed strike access, International Vault offers electric strike control devices. An electric strikes allows the user to open the day gate electronically, without the need for a mechanical lock and key. Configurations are generally fail-safe or fail-secure. A fail-safe electronic strike causes the day gate to lock when an electric current is applied (meaning in the event of a power failure, the gate opens). A fail-secure configuration opens the day gate upon the application of current (meaning the strike remains locked in the event of a power failure). Electric strikes are often equipped with buzzers to signal their operation, and reversible electric strikes can be switched from fail-safe to fail-secure operation as needed. We provide the strike housing and wiring for connection to your day gate, you must rely on your alarm company to install the biometric system itself.